The desire to acquire first editions could be considered the backbone of the book collecting world. First edition books are the first appearances in print of a particular work, and as such convey value and meaning to their owner, aesthetically, emotionally and monetarily. To find out more about what a first edition book is and why it's important to collectors, see what is a first edition? How do I search for first edition books? You can search for first edition books easily on Biblio by either checking the box that indicates first edition in most search forms or looking for the the links on the left after you have searched for a book that allow you to narrow your search by first edition. Generally, we also recommend that you sort your search by price descending when searching for first editions, as this reduces the amount of "noise" generated by first printings of later editions (see first, thus in our glossary). A word of caution: because computers are only so smart, they sometimes make mistakes. Biblio's search system is looking at millions of pieces of information from thousands of booksellers who each have their own way of saying things, so sometimes our search might inadvertently yield a false positive when searching for first editions. Therefore, we strongly encourage collectors to fully read the booksellers' descriptions before making a purchase on Biblio or any other site. Which is the true first? Many books (particularly very popular books) undergo subsequent editions. Each of these editions has its own printing sequence, which means that they will each technically have a first printing. However, these first printings of later editions (often denoted as first, thus) should not be confused with the true first edition, which is the first printing of the first appearance in book form of a work. This is not to say that first printings of other editions of a book are not desirable to a collector. In fact the opposite is commonly true, especially in the cases of illustrated editions, limited editions, or books issued by a fine press. But, in most cases, these subsequent works are not quite as valuable as the original, true first edition. What about first U.S. or first U.K. editions? Are they true firsts? An exception to the cardinality rule is generally made for a book's first appearance in a country or a language. These are considered true first editions, but are generally noted in ways such as first U.K. edition or first French language edition. However, the edition that was first issued almost always carries the most collectibility and the subsequent country-specific editions do so to a lesser degree. How do I know something is a first edition? Properly identifying first editions and first printings can often require specialized knowledge, experience or access to sophisticated reference materials, particularly when the work has specific points of issue. Most professional booksellers have all of these at their disposal and are able to accurately identify first printings. For more information, check out our guide to first edition identification or scroll down to see more reference resources. What is all this about points of issue and first state? During a print run (particularly a first) the publisher or printer might notice small errors and correct them. After corrected, the printing number will remain the same, but these errors and corrections - called points of issue - can indicate at what point in the print run the actual copy of the book was printed. Books with points of issue that indicate they were among the first copies printed are called first state. While this might seem like a quibbling distinction, the difference between first state and second state can mean the difference of thousands of dollars in value for significant works. How much are first editions worth? As with any books, the value of a first edition is determined by its 1) collectibility (characteristics that make it desirable), 2) its scarcity (see what makes a book rare, and 3) its condition. Thus, the actual value of first editions can range from just a few dollars to hundreds of thousands of dollars for very rare and collectible works. For more information on book values and tips for valuing your own books, click here. What about limited editions - are they considered firsts? Yes... and, no. Sometimes a publisher will issue a limited edition (often signed and/or numbered) prior to the release of a trade edition. In these cases, the limited edition is considered a first edition, but the trade edition retains its pedigree as a first edition as well, and is referred to as the first trade edition. Other times, a limited edition might be issued after the trade edition, in which case it is not properly considered a first edition, although it might be noted as first, thus. A noted elsewhere, identifying first editions can sometimes require specialized knowledge as many publishers' practices for denoting first editions are somewhat obtuse and varied. This staple reference work helps the collector properly identify firsts from most modern publishers. Since its first publication in the early nineties, the Ahearn's have kept this important reference work updated with regular revisions, reflecting recent trends in valuation. Not just a book of values, it offers important identification information on thousands of significant first editions. Look for the 2011 edition. A must for every bibliophile, no matter your collecting interest. While Biblio has an online glossary of book terminology available for free, nobody does it like Carter. Now in its eighth edition, ABC is the comprehensive reference work for book collectors and dealers everywhere. 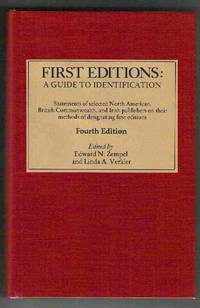 Indispensable to the collector of first editions, this portable little guide contains exhaustive and compact information on the markings used by thousands of publishers to identify first editions. Another immensely handy guide, this modest little volume is packed with information on the points of issue of many first editions, modern and classic. Like the companion volume above, it can easily be slipped into a back pocket or purse. Questions? Did we miss anything about first editions we should have included?